The True North Youth Foundation (TNYF) was founded twenty years ago, originally called the Manitoba Moose Yearling Foundation; it was created in order to fill the void left by the former Jets team called Goals for Kids who did great work amidst the community. The True North Youth Foundation is relentless in pursuing its vision of assisting youth with meaningful, empowering programs. This means achieving physical, social, mental and emotional aspects of a child’s life, striving to encourage them to reach their full potential. “We are champions for youth, we are a foundation that wants to give kids an opportunity,” says Dwayne Green, executive director of TNYF. Amidst the umbrella of the TNYF are three programs: The Winnipeg Jets Hockey Academy, Camp Manitou, and Project 11. The Winnipeg Jets Hockey Academy (WJHA) is the longest running program, and aims to create solid partnerships with school divisions. It is a way to connect hockey with school, and create an opportunity for children to play hockey who wouldn’t otherwise have the chance. The academy works to provide well-rounded hockey players, as well as increase graduation rates, using the sport as a vehicle to get kids inspired to succeed at school. With transportation, coaching, meals and ice time provided, the program removes the barriers that would prevent kids from playing hockey. Murray Cobb, WJHA director says, “If you can find that spark to get them excited, then they are set up for a path toward success and graduation.” With 50/50 as their biggest funder, the program has been able to provide 650 kids with the opportunity to play hockey, and it is all thanks to Winnipeg Jets and Manitoba Moose fans for supporting the foundation. 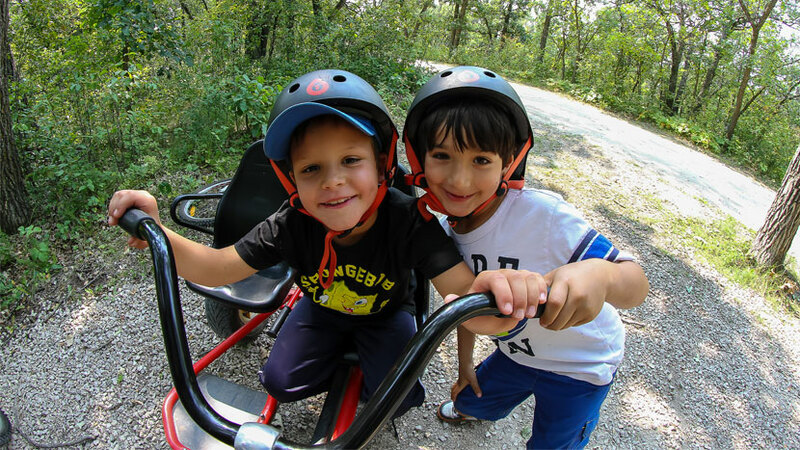 Due to its proximity to the city, Camp Manitou aims to give kids in Winnipeg an opportunity to enjoy the outdoors, be on a team, as well as challenge them to try new things. Located in Headingley, it doesn’t matter what part of the province you’re from, it provides the chance for kids to be kids, breaking down barriers and bringing them together at a place where they can laugh, play, and push themselves out of their comfort zones. “What I find is that everything from the home environment, or wherever they live, that’s all gone and wiped away when they come here,” says Rick Bochinski, director of the camp. “Everyone’s at the same spot, and that’s really exciting to see.” Made possible through funding from 50/50, the golf tournament and other fundraisers, Camp Manitou has been given new life, and continues to improve the facility with features such as a brand new 25 foot climbing wall and a new zip line. The True North Youth Foundation continues to provide youth in Manitoba with opportunities to grow as individuals, inspiring and supporting them to be successful in life. Executive chairman of True North, Mark Chipman says, “there’s something very natural about the connection between youth and hockey and sport, and we are able to leverage that in a positive way.” He goes on to talk about the rewarding experience of seeing the progress the kids make, and attributes the opportunities made available to them, to the Winnipeg Jets fans, and their generosity and passion, which allows True North to do the work that they do.